I am an artist schooled in mathematics, computers and art. In previous lives, I attended graduate school in mathematics, programmed operating systems for IBM, and raised two children. While my work has been exhibited in the SEMA Gallery in Rochester MN for twenty years, most of my personal growth as an artist has been in the last several years as a protegee (with mentor Mary Bergs) in the WARM (Women's Art Resources of MN) program. 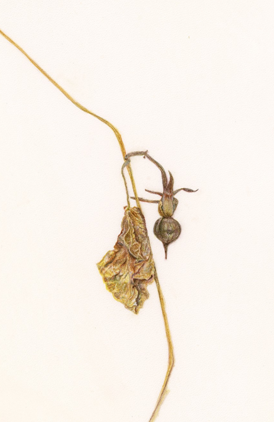 I began studying botanical drawing & painting with Denise Walser-Kolar in 2010 and attended my first ASBA conference in the same year. My art is motivated more by feeling than by attachment to any single medium, so I use drawing, lettering, painting, photography, digital art, whatever works; I think of it as creative, somewhat structured play. My goal is to show the joys and possibilities in the mundane which we take for granted or just don't notice.